Adekan mural. All rights reserved. The brazen murder of Jamal Khashoggi by Saudi assassins has so far failed to prompt the Turkish state to reflect upon how it treats its own media. There was a biting chill in the Bosphorus air for the Istanbul funeral of the late journalist. Some were feeling the early onset of winter. Others were feeling the snap of President Recep Tayyip Erdoğan’s resolutely authoritarian regime. Local writer Cigdem Mater was detained at dawn that morning. Her crime? Attempting to establish a new media outlet. A police report said Mater was planning to stir protests through the platform. Had an uprising been her goal, she was picking the wrong medium, in the wrong country, at the wrong time. Turkey’s history of multiple coups has produced insecure political leaders. The Turkish Journalists Association says that around 200 media professionals have been jailed since the most recent attempted coup in 2016. A pre-occupation with monopolising the media long predates Erdogan and his AK Party, founded at the turn of the millennium. Only over the last few months however has the country’s free press finally taken its last breaths. The sale of liberal title Hürriyet to new publishers this past summer represented the fatal blow. Long-time owners, the Dogan Group, made the sale reluctantly, ground down by contentious state fines and prosecutions. Hounded for the best part of a decade, the company accrued some $3billion in penalties. Both the executive publisher and editor-in-chief were jailed. They finally gave up the fight following a constitutional referendum that gave the Dogans no prospect of a reprieve: voters gave Erdogan a mandate to rule by decree and to remain in post as president until 2034. With 21 of 29 media brands now overtly backing the ruling party, new evidence confirms that Turkish readers have given up on the traditional media. The highest level of exposure to ‘stories that are completely made up for political or commercial reasons’ is reported here. The country came top in a global survey of 74,000 news consumers across 37 countries. The research was conducted by the Reuters Institute for the Study of Journalism. It found that Turkish readers also hold the highest levels of concern that openly expressing their political views online could get them in trouble with authorities. Thought crimes have always been readily penalised here but since public protests in 2013, over 160,000 dissenters have faced jail time. When the constitutional referendum went Erdogan’s way, opposition parties attributed the result to a disparity in access to media coverage. Voters would not support a leader who was imprisoning his own people in such numbers if they were kept informed of the scale of his crackdown, they said. Supporters counter that Erdogan has earned his many electoral successes, hard-won through reviving the economy [until recently] and advocating traditional, Anatolian values. How to arrive upon the truth without an independent media to arbitrate? One man is stealthily taking it upon himself to fill the vacuum created by the collapse of critical media. He operates anonymously, nocturnally. “I want to awaken what each individual lives in their day-to-day lives in Turkey,” says ‘Adekan’. 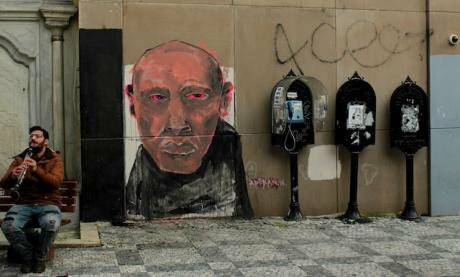 The street artist wants Turks to reject the status quo and pursue greater freedoms. Adekan. "Omuzia", 2012. Face distorted to hide identity. All rights reserved. Through spray paints and acrylics, the 27-year-old son of a rail-road worker depicts sinners and sufferers on urban walls left unguarded at night. The menacing faces he’s drawn – some human, some animal, some hybrid monsters – pockmark Istanbul. He says he doesn’t assume people will see what he sees in the faces, but some almost explicitly evoke political stooges, while others seem sure to conjure up a universal sense of sad powerlessness. Then there are the pigs. No-one can look at pigs without feeling the need to take a shower. “I expect people feel ‘fear’, when they see his work,” a fellow street artist, Petuk, tells us as we peer at an image of one of Adekan’s most famous faces. It’s devil-red and carries the word destiny emblazoned on the forehead. Fear perhaps, but appreciation too. The owner of the building façade invited the pair in for Turkish tea after catching them in the act, we’re told. There are local elections in Turkey in the spring. Istanbul’s eastern district of Kadikoy has voted against Erdogan in every vote since Adekan began practising his craft in the area after relocating from a grey ‘closed-minded’ industrial city in central Anatolia. His work, along with designs and poetry penned by others galvanised by ‘Gezi’ five years ago (the environmental campaign at Gezi Park that morphed into a mega civil rights protest) now appears all over Turkey’s former capital. It begs the question, will the AKP now incur wider losses at the polls? 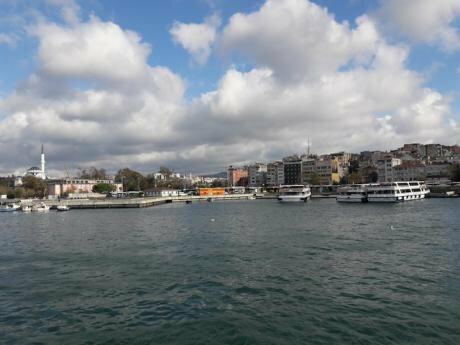 Kadikoy is Istanbul’s most tolerant quarter. The municipality has sponsored an international street art festival each year since the Gezi protests. Nonetheless, our voices hush as a police officer walk into the café we’re meeting in, at the ferry port on the Asian shore. We silently move on, in much the same way reporters are quietly censoring themselves across Turkey every day now. Orhan Pamuk, Turkey’s most famous journalist, is among those now practising self-censorship. The Nobel prize winning author simply can’t practice journalism in Istanbul, the city that made him, without provoking charges of ‘Insulting Turkishness’ and the accompanying prison sentences they bring. A 20 minute boatride away, on the European side of the city, he has curated some protest art of his own. 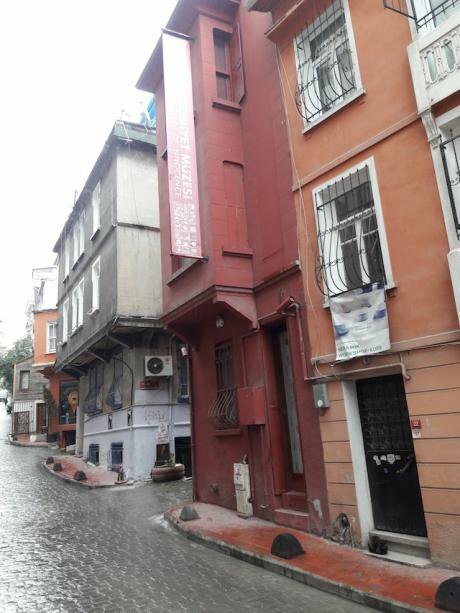 The Museum of Innocence, a three story private museum based on his book of the same name, is a unique portrait of Istanbul, his life and the struggle to speak uncomfortable truths in climates of fear. It centres on the story of a fictional journalist who hoarded objects from an illegitimate love’s house during a previous post-coup crackdown. “Disparate objects, when placed side by side, can bring forth unprecedented thoughts and emotions,” is the concept’s claim. Like Adekan, Pamuk has found a means to swerve censorship in an attempt to safeguard Turkish society from losing sight of the repressions being committed, without conventional accountability, in its post-media age. 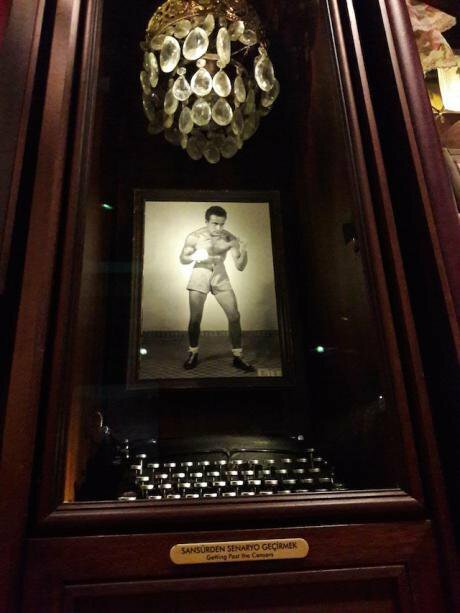 Fighting the censors - a display at Orhan Pamuk's Museum of Innocence. All rights reserved.‘Just how dangerous is it to work as a journalist in Istanbul?’ we ask the museum supervisor. He’s too cowed to discuss it, but he scribbles the name Hrant Dink on a post-it note. Dink was a Turkish-Armenian journalist, assassinated in 2007 for narrating Turkey’s denial of the Armenian genocide a century ago. A photo later surfaced of Dink’s killer, flanked by smiling Turkish police, posing in front of the Turkish flag. As Istanbul mourns Khashoggi, so it mourns the wider death of journalism here. Street artists need shadows to work in, but these are long shadows indeed.